Students for Society (SFS), a Left-leaning student organisation won the president post of Panjab University Campus Students Council (PUCSC) polls. 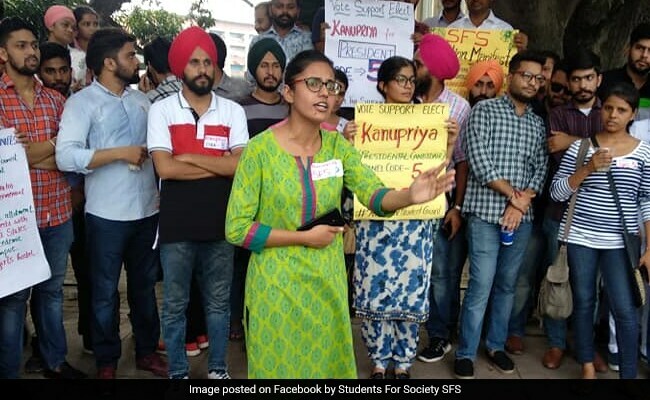 Students for Society (SFS), a Left-leaning student organisation won the president post of Panjab University Campus Students Council (PUCSC) polls, the results of which were declared Thursday. Kanupriya of the SFS, an MSc 2nd year student from Zoology Department, elected as president of the PUCSC, became the first woman to have won the post. Meanwhile, ABVP drew a nil in the central panel and NSUI settled for the joint secretary post. Last year, National Students Union of India (NSUI), student wing of the Congress had won three posts. Kanupriya wrested the seat from rival ABVP-led alliance candidate Ashish Rana with a margin of 719 votes, PU officials said here. The Akhil Bharatiya Vidyarthi Parishad (ABVP), student wing of RSS was polled with 2083 votes. Out of the total 15,381 students who were eligible to cast votes in the PUCSC polls, Students Organisation of India (SOI) got 1997 votes. NSUI got 1583 votes while 209 votes went to NOTA. Press Trust of India reported that the post of vice president went to Daler Singh of the Students' Organisation of India (SOI) and the Indian Students Association (ISA). Singh defeated Pardeep Singh of the NSUI and the Hindustan Students Association (HAS) with a margin of 928 votes. The post of secretary went to Amarinder Singh, joint candidate of the SOI, the HAS and the Indian National Students Association, while the joint secretary's post was bagged by Vipul Atray of the NSUI. Congratulations Punjab University on electing your first female president! My heart soaaaars with pride. Significantly, no prominent students outfit was able to make a clean sweep in the polls this year. A total of 21 candidates were in the fray.